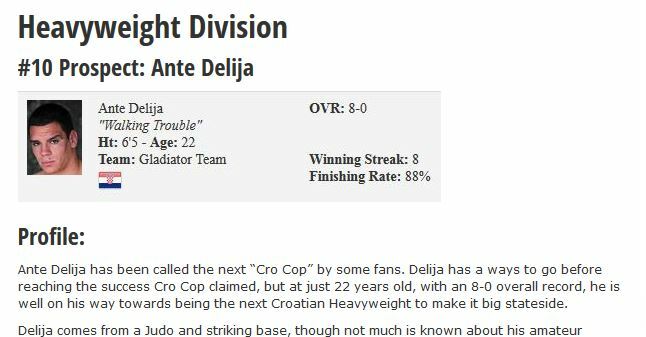 Ante Delija has been called the next “Cro Cop” by some fans. Delija has a ways to go before reaching the success Cro Cop claimed, but at just 22 years old, with an 8-0 overall record, he is well on his way towards being the next Croatian Heavyweight to make it big stateside. Delija comes from a Judo and striking base, though not much is known about his amateur background. He made his MMA debut in 2011 and quickly jumped out to a 5-0 record over, winning every fight via finish. Delija faced his first test in well-traveled UFC veteran Ricco Rodriguez. Delija dominated most of their fight with crisp striking and excellent takedown defense to take home a 2-round unanimous decision. Deljia improved his record to 8-0 overall in 2013 as he defeated two journeyman in his native Croatia. Delija trains out of Croatia’s Gladiator Team, which is home to fellow Heavyweight prospect Maro Perak. The camp is considered to be an up and coming team in Europe, though Delija has stated he considers them one of the Top 3 teams in Europe. The camp has no known connections to any of the bigger promotions. Perak was rumored to have signed with Strikeforce, but that never came to fruition. Delija will have to continue and generate his own buzz on the Croatian fight scene in order to get the UFC’s or Bellator’s attention. Ante Deljia surprised me with his skill level. He readily handled veteran Ricco Rodriguez, and though Rodriguez has looked less than stellar as of late, it was a good showcase fight for Delija’s vast potential. Delija has great size at 6’5. He moves very light on his feet and that is one of his main strengths while striking. His conditioning looks up to par and he does a good job playing to his strengths. His takedown defense has proven somewhat effective though he has yet to really face a true top level grappler. Delija has big power in his right hand and also likes to attack with leg kicks and knees from the clinch. He also is a natural finisher, who goes in for the finish whenever he smells blood. Delija’s question marks revolve around his overall ability to fight off his back and dealing with world class grapplers and wrestlers. We have continually seen European fighters struggle at times with their transition towards fighting stiffer competition. Delija has quickly risen through the Croatian ranks, but we all have to remember he is only 22 years old. With a few more wins, he may end up signing with a bigger promotion, but is he ready for consistently stiffer competition. I am not so sure at this point, and could even see him struggling in M-1 or Bellator’s Heavyweights Divisions. If Delija is given time to develop, he has the raw potential to be a very special prospect. It is not often that you see a 6’5 Heavyweight move the way he does. I hope Delija broadens his training practices, and possibly heads over to the Netherlands to refine his striking. Should Delija develop his overall fight game, in 2-3 years, I could certainly see him having Top 15 potential in the UFC. As of now, he’s just too young to have consistent success at the UFC level. We recently saw a prospect like Nikita Krylov struggle in his debut for a variety of reasons. 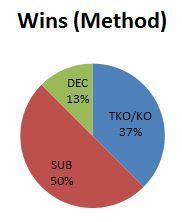 Delija needs to avoid these same mistakes and realize that he cannot win in the UFC on talent alone. He needs to align himself with the trainers and management that will carefully guide his career and develop him into a feared striker that truly could reach future contender status. Delija may not be UFC ready now, but when he is, we may be looking at the next big thing from Croatia.